In the 1960s Iran felt a great need for tractors and the possibility of manufacturing them domestically. Many possibilities were taken into consideration by the country's planners and it was finally decided that the best would be to produce tractors in cooperation with Romanian manufacturers. And thus ITMC was established. The first tractors were assembled in 1969. Two types were produced: the U650 and U651 models both of 65 HP. From then onwards other models were added to the range produced in the country: models MF135 of 45 HF, MF 165 of 62 HP, MF 185 of 72 HP and MF 295 of 92 HP. These were produced from 1975 onwards and the MF 285 replaced the MF 185 in 1977. Today this model, the MF 285, is still produced in Iran with 75 HP and 91% of its components made locally. In 1987 the company and the manufacturing facilities were segmented into the forgery, engine making, and casting sections each of which became an independent company. In the following years the Mother Company and the related companies cooperated to add new models of higher power and capacity and to diversify the range of products by adding large and small trucks, and vans, to the range. In 2002 a new model, the ITM 800 of 80 HP was also added to the range, designed and manufactured at home. This was followed by the ITM 840 of 84 HP and MF 6290 of 142 HP. In 2003 a manufacturing plant was set up in Sanandaj, Kurdistan Province, with a production capacity of 3,500 tractors per year. 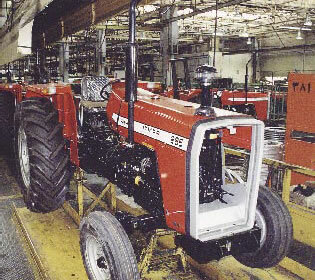 In 2003 again, the manufacturing unit in Urumieh, which, up to then produced garden type tractors, was taken over and upgraded to produce the MF 240 model as well. The zenith of the activities and successes of the ITMC arrived in the same year, 2003, when Iran held negotiations with Venezuela for the production of tractors in that country through the joint effort of the two countries and using Iranian technology. 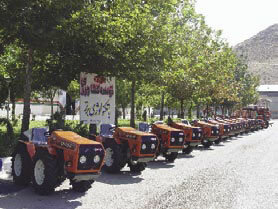 During these years, especially in recent times, ITMC has exported tractors to Turkey, Dubai, Jordan, Lebanon, Republic of Azarbaijan, Qatar, Iraq, Yemen, Libya, Sudan, Egypt, the Ivory Coast, Zimbabwe, Kenya, Uganda, Bangladesh, the Philippines, Sri Lanka, Thailand, Brazil, Chile and even Britain. Today, in addition to tractors, the Company produces 2.5-3.5 ton trucks; cutting hubs and shaper/cutter tools; lab and calibration equipment; agricultural processing machinery; and tractor production lines. It is also engaged in the R&D and design of many other items. Iran is still considered as an agricultural/semi-industrial country by current economic criteria. The agricultural sector secures 22% of the GDP, 23% of the employment opportunities, 80% of the nation's food demand, 90% of the raw agricultural materials required, and 33% of the country's non-oil exports. Therefore, this sector plays a vital role in the country's economy. Naturally, agricultural machinery, particularly tractors are indispensable to an efficient and prosperous agriculture; hence the significance of ITMC to Iran's economy. ITMC, like any other production entity, has gone through many ups and downs under the influence of economic fluctuations. Nonetheless it has managed to make constant progress through hard work, intelligent and conscientious employees, and dedication to the nation's glory. It has designed, produced, and developed products at minimum costs through optimization of assets, and of highest quality, to grab increasingly larger shares of both the domestic and international markets. It is fully aware that in order to survive and make progress in the modern competitive world, it must make best use of its capabilities, using modern technology, and working with devotion and dedication to achieve its ideal of "Being a Forerunner in the Production of Agricultural Machinery, Capable of Competing with the Best Worldwide."